Welcome to RapidMiner Studio, the easy-to-use visual environment for predictive analytics. With these simple instructions, in five minutes you will be building models and making predictions. No programming required. You may want to verify that your system meets the system requirements before beginning the installation. To download the application, go to the RapidMiner website. Log in if you haven't already. See below if you need to create an account. 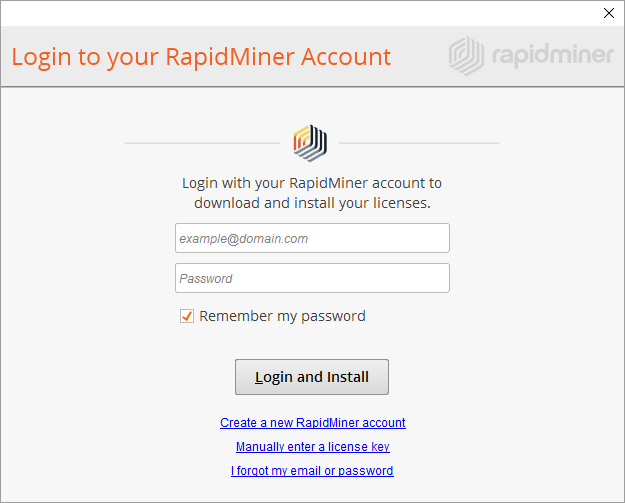 If you just want to download RapidMiner Studio without logging in, click on Downloads. Click on your preferred operating system to begin the download. Your current operating system will be highlighted. 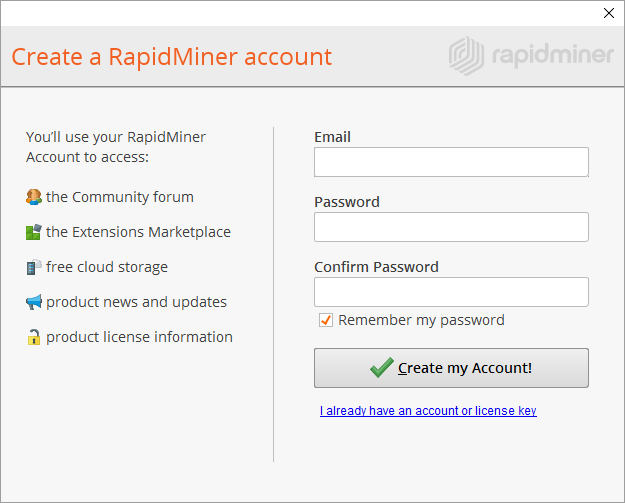 While you do not need to create an account to download software, complete the registration and click Sign up to experience the benefits of the RapidMiner community. Note that the password must be a minimum of six characters. If you have already downloaded RapidMiner Studio, click the . Otherwise, click the link to download. When the download completes, install the software following the instructions appropriate to your platform. If you are upgrading RapidMiner Studio, make sure to quit the application before trying to install a new version. Follow these simple instructions to run the launcher that installs RapidMiner Studio on Windows. Double-click the downloaded file (for example, rapidminer-studio-<version>-win64-install.exe). If prompted, allow the program to make changes to your computer. The RapidMiner Studio Setup Wizard appears. Click Next to continue. Read the terms of the license agreement and click I Agree to continue. Select a destination folder (or leave the default). Please ensure that the folder path does not contain + or % characters. By clicking Install, the wizard extracts and installs RapidMiner Studio. When the installation completes, click Next and then Finish to close the wizard and start RapidMiner Studio. Read the terms of the license agreement and click I Accept to continue. 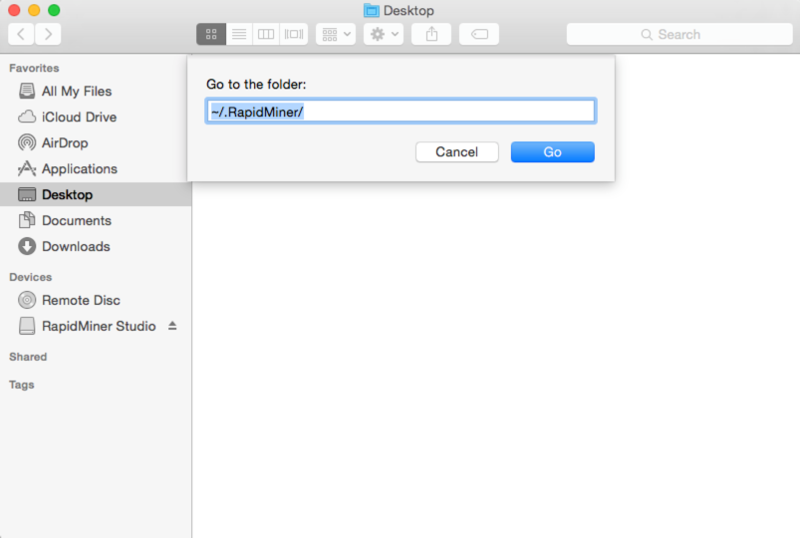 Double-click the downloaded file (for example, rapidminer-studio-osx-<version>.dmg). Drag RapidMiner Studio.app to your Applications folder. If prompted to replace an older edition, select Replace. Read the terms of the license agreement and click I Accept to continue. 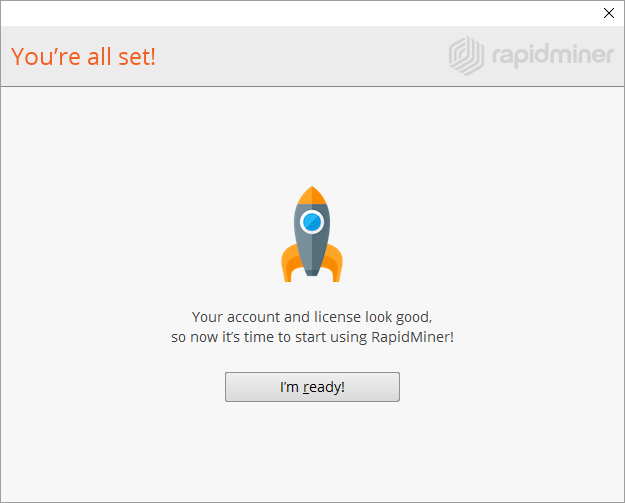 RapidMiner Studio opens. The RapidMiner Studio installation package for Linux does not include a Java Runtime Environment. Before installing RapidMiner Studio, use the package manager of your distribution to install a version 8 JRE (unless it is already present with your operating system) and verify that the JAVA_HOME variable points to it or java (contained in the bin folder of your Java installation) is on the PATH. Double-click the downloaded zip file (for example, rapidminer-studio-<version>.zip). The extracted folder contains script files for different operating systems. Please ensure that the folder path does not contain + or % characters. Open a terminal window and run ./RapidMiner-Studio.sh from the directory containing the download. Create my Account Creates an account with the given user information. 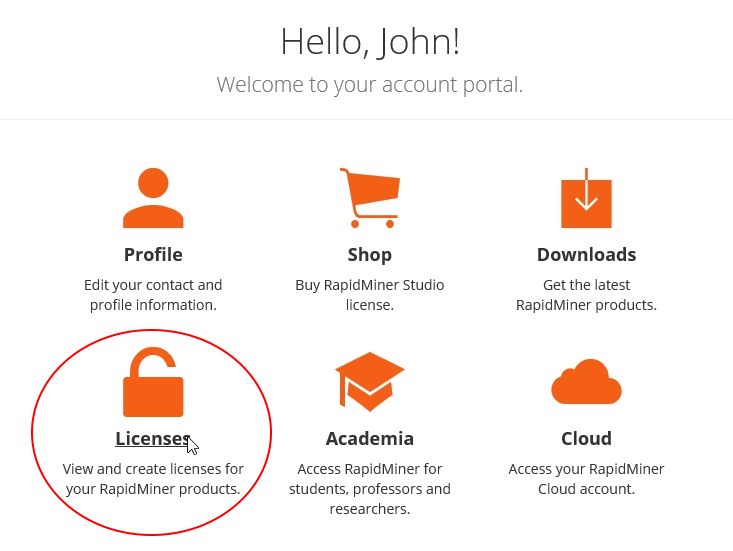 I already have an account or license key If you previously registered, enter your rapidminer.com credentials to login so that you can download or install your license(s). Once logged in, if you have purchased a license, the system installs it based on your credentials. 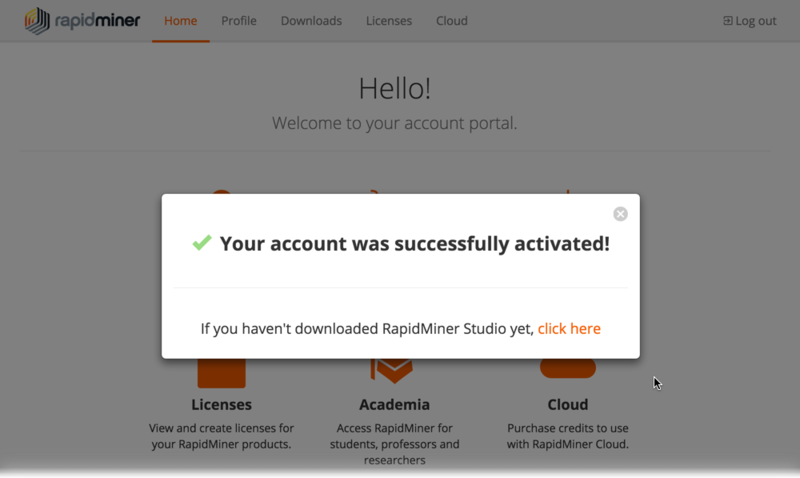 Creating an account requires that RapidMiner Studio can access the Internet. If you do not have an Internet connection for the application (for example, if prevented by a firewall), create an account through your browser and enter your license key manually. Complete the steps to create an account by entering your email address and password. Note that the password must be a minimum of six characters. Immediately, the system sends an activation email to the address that you registered. 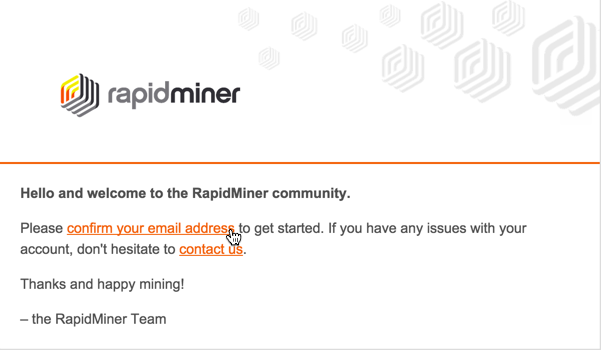 (Allow email from RapidMiner if you do not see an email titled "Verify Your Email" in your inbox.) Periodic checks verify whether your email has been validated. Return to the RapidMiner Studio application. Complete the installation by clicking I'm ready. 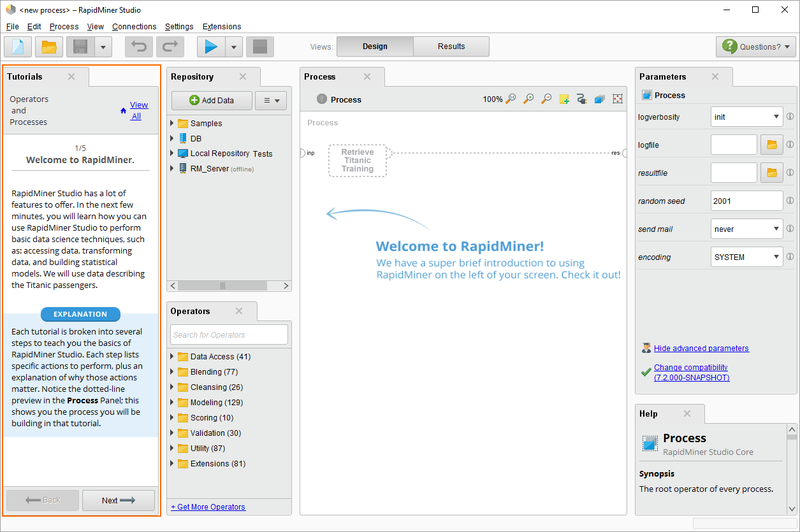 If this is your first time installing RapidMiner Studio, we recommend that you start with displayed Tutorial to learn just how easy code-free can be. Happy mining! 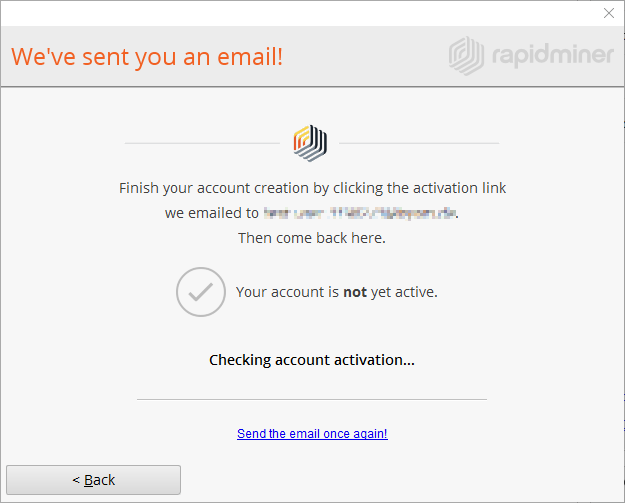 Enter your email address and password to login with your RapidMiner.com account and then click Login and Install. 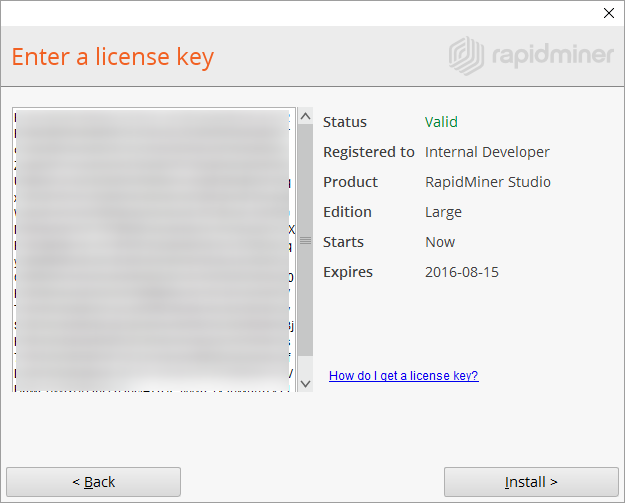 Note: Once installed, you can also add or update licenses using the Settings > Manage Licenses menu within the RapidMiner Studio application. 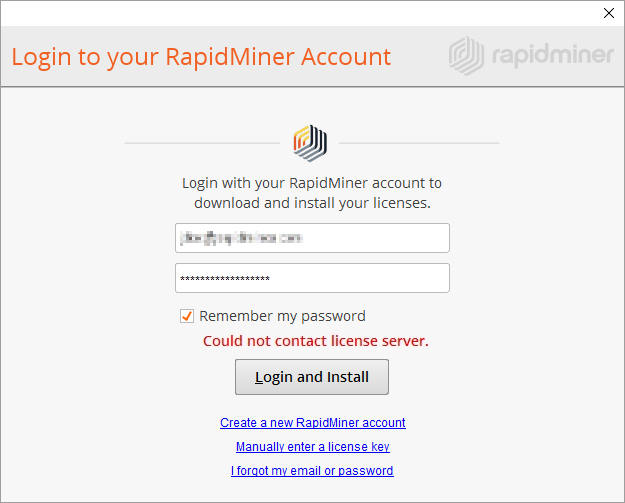 If you cannot access your RapidMiner.com account (for example, if RapidMiner is blocked by a firewall), your license cannot be automatically loaded. If this is the case, you can enter your license manually by clicking on the Enter a license key link. To enter a license key manually, you must first copy the key to your clipboard. The key is available from the Licenses page of your account portal. Click View License Key next to the appropriate license to display the key. Click in the box containing the key to select it, then copy it to your clipboard. 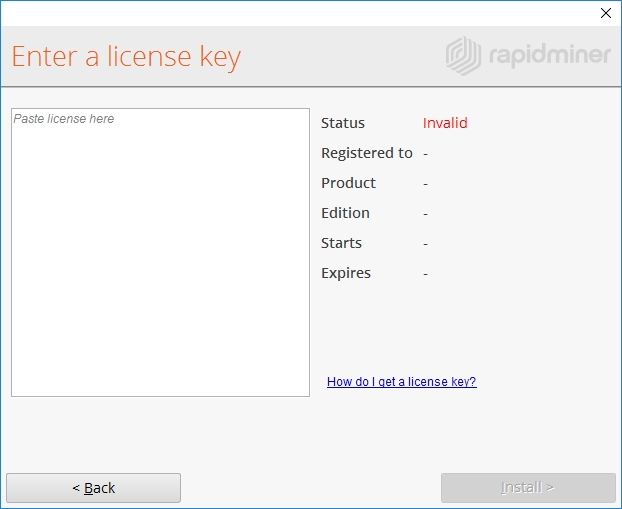 Return to the RapidMiner Studio login screen and click the Enter a license link. Paste your license key into the box. Note that the right-hand portion of the window populates with license information, including the edition and expiration. From the login screen you can also Reset Credentials. Clicking the link opens the account page. From there, you can change your email or password. Once you click Login and Install, the Success screen appears. Click I'm ready. Go be a hero! If this is your first time installing RapidMiner Studio, we recommend that you start with displayed Tutorial to learn just how easy code-free can be. Happy mining! The RapidMiner Marketplace is your one-stop site to download and share extensions for RapidMiner Studio. Follow these steps for detailed instructions on accessing and using the RapidMiner Marketplace, or take a look at Marketplace here. By default, the RAPIDMINER_HOME variable is set to the folder location of the start script. If you leave the script within the installation folder (the most common method), the environment variable is set correctly. If you move the start script out of the installation folder, you must set the environment variable RAPIDMINER_HOME to the installation path of RapidMiner Studio. This allows RapidMiner to find its resource files. 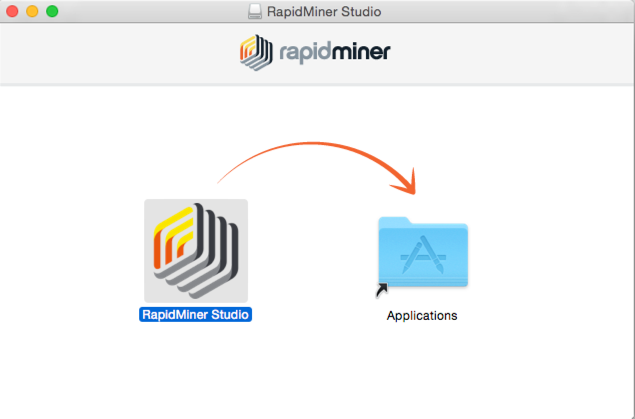 At the first running of RapidMiner Studio, the software creates a .RapidMiner folder in your user home directory. RapidMiner Studio stores your personal settings and data (e.g., database connections) in this folder. If you ever need to completely remove RapidMiner or to discard all personal settings, simply delete this directory. Do not remove the directory if your RapidMiner Studio installation is damaged and you want to re-install it. By maintaining the .RapidMiner directory, your personal data will be kept in tact for the new installation. In the resulting dialog, enter ~/.RapidMiner/ and click Go. From the pull-down menus, select View > as Columns to select the columns view. (Alternatively, use the keyboard shortcut .) 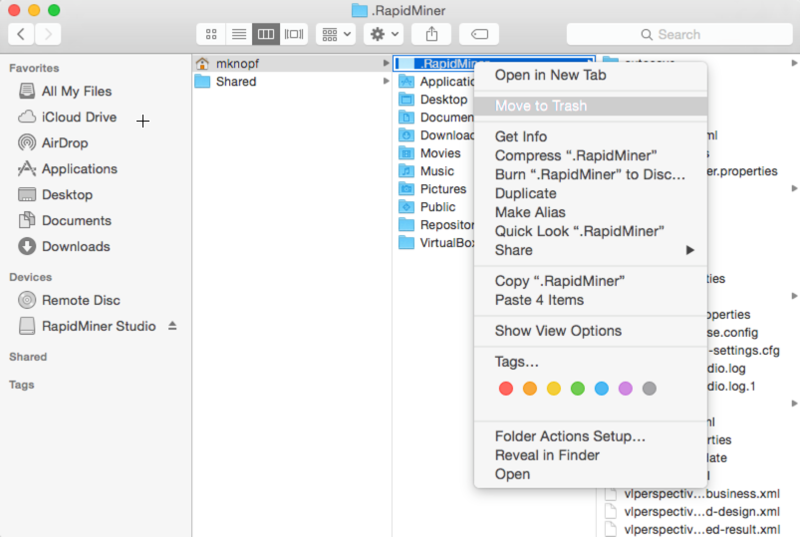 The .RapidMiner folder is highlighted. Delete the folder (Move to Trash).